The extra year of development has helped Assassin’s Creed as a whole, as Origins is the next level for the series. It’s bigger, better and more robust than ever before, featuring an engaging combat system and surprisingly compelling side quests. That isn’t to say there isn’t anything wrong with it, though, as traversal remains clumsy, the mission structure can get repetitive and the AI can be either overly aggressive or plain dumb to the point of frustration. In essence, Assassin’s Creed Origins is much the same game as the original Assassin’s Creed, which came out a decade ago. It’s a formula that people like to play, and it’s certainly been honed and improved over the years. Origins is, then, undoubtedly the best iteration of this formula yet. But I yearn for a fresh approach and new ideas, something that astounds the senses as much as the wondrous world this game inhabits. 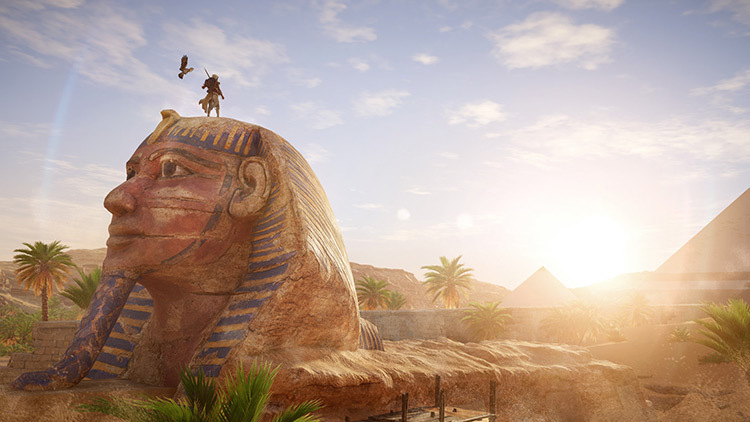 Not completely back to the drawing board, Ubisoft takes some of their better old ideas and blends them with new ones to make one of the best Assassin’s Creed games to date in Assassin’s Creed Origins. Assassin's Creed returns with an entry that moves the series forward, but also goes back to the beginning of the Brotherhood. 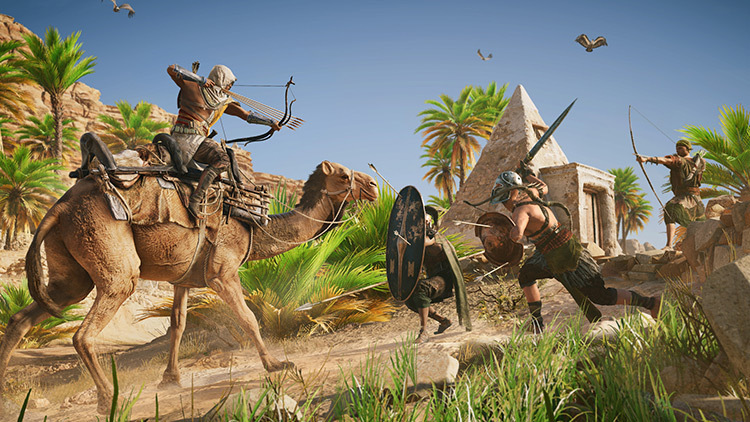 This new entry is a bit more of an action RPG, telling the story of how Bayek of Siwa becomes the first Assassin alongside a number of intriguing side quests. Combat is overhauled, but it's still a bit muddy when fighting multiple enemies. What absolutely does work is the world itself; Egypt is beautiful and the diversity in the environments is impressive. I'm unsure if Assassin's Creed Origins will convert anyone who isn't already a fan of the series, but it does what it does well enough to join the top of the franchise. While Assassin's Creed Origins reaches great heights in this new setting, it routinely runs into issues that bog down the overall experience. Technical issues make for an inconsistent experience and its new gameplay pillars wobble under the weight of its systems. But despite this, the world of Origins remains fresh and exciting to explore, which is a testament to the remarkable setting and compelling story. You can nit-pick all you like about the odd funny glitch here and there and some duff NPC dialogue, but Assassin’s Creed Origins is a near flawless open-world gaming experience. After a year’s absence, Assassin’s Creed is back and it has been reborn. And I’ll happily admit that I’ve got egg on my face, because it’s better than ever. I could go on and on about how much I’ve fallen in love with the setting, the improvements to the core gameplay, and the way it feels like Ubisoft have breathed new life into the franchise. The year off and restructure of the game has done wonders for it, almost bringing Assassin’s Creed into the RPG territory rather than just being and action adventure game. The RPG side of the game is handled very well, and its challenge is really very good in the larger modern gaming landscape. Combat still needs tweaking from a design perspective, but is more than passable while the checklisty mission system does need a major overhaul, but when stacked against the game-world created here, and how much content it’s filled with, it can be forgiven. 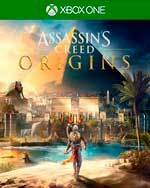 Origins es mucho más que un "Assassin's Creed en Egipto", y se desvela como uno de los mejores (sino el mejor) capítulo de la Hermandad de Asesinos, revolucionando la base jugable a un nivel que no se había visto desde Assassin's Creed II. Que lo momifiquen junto al resto de faraones, porque este juego es digno del Valle de los Reyes. 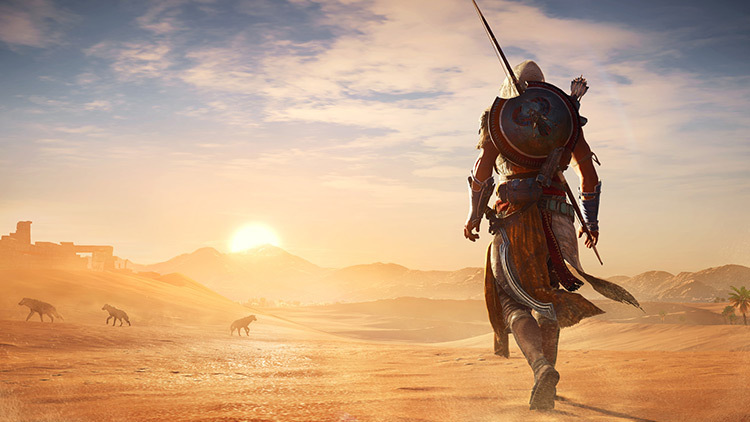 Assassin's Creed Origins es la experiencia definitiva de Assassin's Creed. Recoge todo lo bueno que había mantenido la franquicia (recreación histórica, mundo abierto, etc) y lo eleva de nivel con añadidos como el renovado sistema de combate o su sistema de progresión al estilo RPG. Nos habría gustado haber visto algo más de innovación, esa característica única que llevará a la saga más allá, pero es innegable que Assassin's Creed Origins es un paso en la dirección correcta. 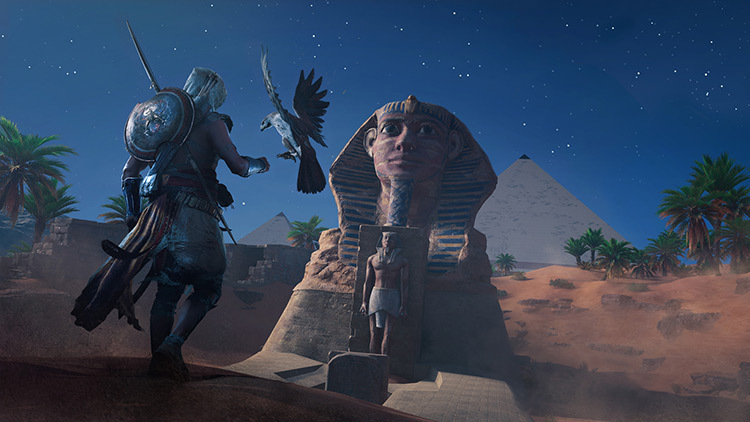 Si alguna vez te interesó la saga, creemos que tienes que darle una oportunidad a esta entrega, y si te apasiona el Antiguo Egipto, vas a disfrutar sumergiéndote en el mundo que Ubisoft nos ofrece. 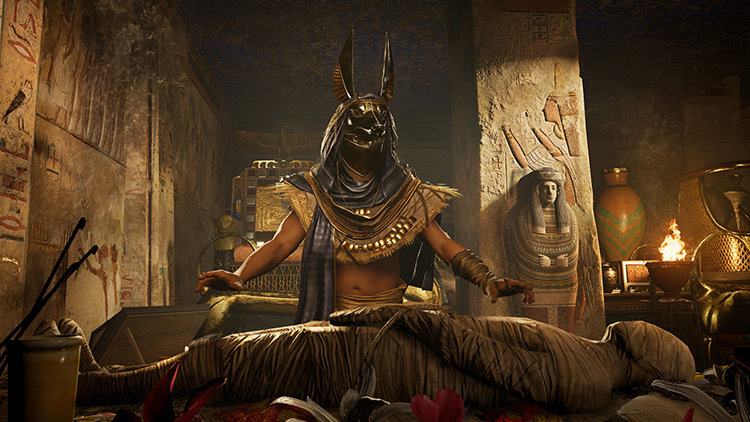 Si vous attendiez qu'Origins réinvente complètement Assassin's Creed, vous pouvez retourner dormir quelques siècles dans votre sarcophage. Si vous attendiez qu'Origins pousse la série en avant et l'entraîne vers ce qu'elle a de meilleur, soyez les bienvenu·e·s ! Des combats retravaillés, des phases d'infiltration plus dures, une orientation plus marquée vers le RPG, cet épisode fait des avancées notables dans tout un tas de domaines. En choisissant de s'inspirer de ce qui se fait de mieux sur le marché pour son système de combat, l'exploration et l'interface, Assassin's Creed Origins fait figure de lifting bienvenu pour une série qui en avait besoin. L'épisode se dote au passage d'une narration et d'un scénario plus travaillés que jamais et portés par une galerie de personnages très réussis. Lo abbiamo giocato per oltre quaranta ore cercando di spolpare ogni suo singolo segreto e ci siamo più volte fermati ad ammirare il suo meraviglioso Egitto, tutto per rispondere ad un semplice quesito: cos'è Assassin's Creed Origins? Per noi è una cornucopia, il videogioco che incarna la forma mentis degli studi di sviluppo di Ubisoft e contiene al suo interno tutte le idee, i desideri e le evoluzioni congegnate dai designer del colosso francese. Dla fanów serii to tytuł absolutnie obowiązkowy. 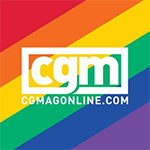 Ubisoft wystosował do nich prawdziwy list miłosny, jakby chciał potwierdzić, że ostatnie słowo w kwestii rozwoju jego flagowego dzieła nie zostało jeszcze powiedziane. Nowe rozdanie, jakie przynosi debiutujące na rynku Origins, to nadzieja na zupełnie nową jakość w przyszłości. Solidny fundament został położony, pozostaje ufać, że na tym się nie skończy.